On 42nd Street between Fifth and Sixth Avenues, where Bryant Park now stands, the Crystal Palace welcomed its thousands of awe-struck visitors. 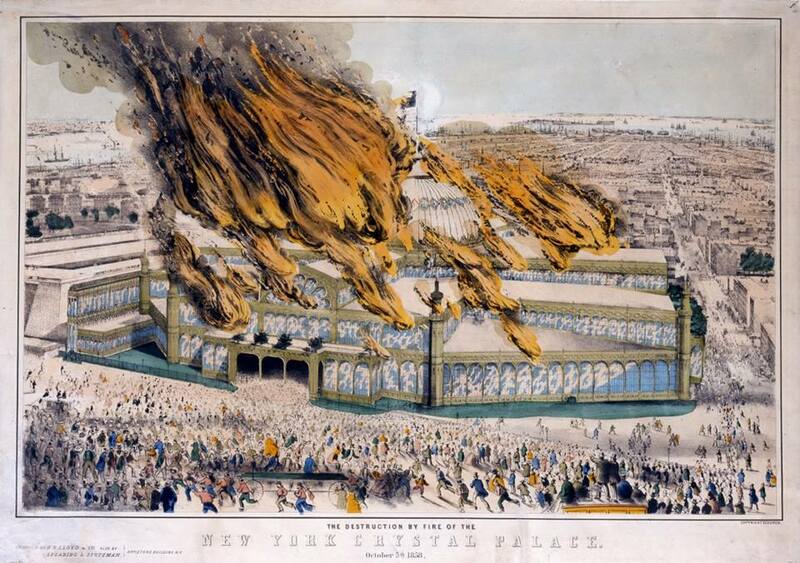 Believed impervious to fire, it burned to the ground 155 years ago, on Oct. 5 1858. The conflagration started in a lumber room and within 15 minutes the huge dome had collapsed. 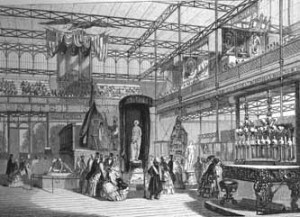 I wonder whether any of the exhibitors were able to salvage their goods in time – Samuel Morse had his telegraph there on view, and Isaac Singer was showing his new invention, the sewing machine, which would transform our world in ways that couldn’t have been imagined. Across the street stood the tallest structure in New York, the Latting Observatory, 315 feet high. Warren Latting erected a wooden tower resembling a scaled-down oil derrick as a tourist attraction in conjunction with the fair. Sightseers could take a steam-powered “safety hoister” elevator up 315 feet in a tiny, ornately decorated cab to the pinnacle of the tower. There they would admire the marvels of Manhattan through a battery of telescopes. A meticulously detailed engraving, drawn in 1855 by B.F. Smith and engraved by William Wellstood, documented the bird’s eye view of the city south of 42nd Street. 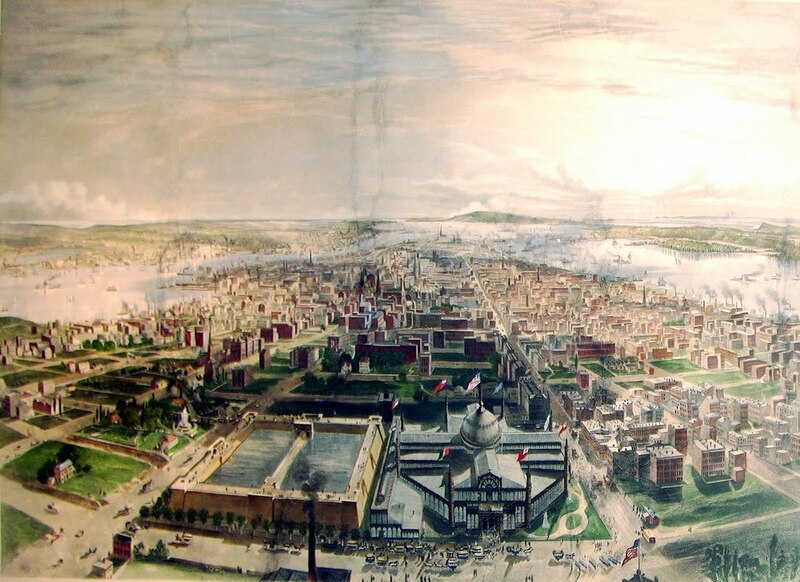 It revealed the sheen of the Crystal Palace and the bulk of its neighbor, the brick-walled Croton Distributing Reservoir, which had supplied the city with pure drinking water from upstate since its completion in 1842, when the neighborhood was largely fields and cows. To the south you could just see the neo-Gothic spire of Trinity Church, a geographic talisman of New York the way first the Woolworth building and then the Empire State Building would be for future generations. People would go courting up in the steeple. The Reservoir had 50-foot-high Egyptian-style parapets, 25 feet wide, upon which the fashionables of the day had grown to favor promenading. Later, the 42nd Street Public Library would come, with its 20,000 blocks of marble, its Beaux-Arts edifice, its lions cleverly named (in the 1930s by, of all people, Mayor Fiorello LaGuardia) Patience and Fortitude, the two traits absolutely required of any writer. 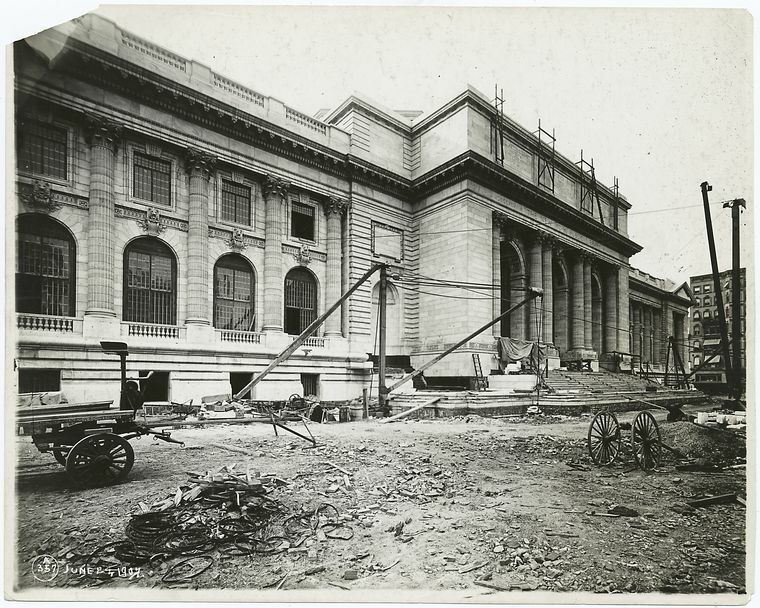 The site would be excavated by 500 workers over the course of two years before construction could begin in 1902, and the library wouldn’t open for business until 1911. 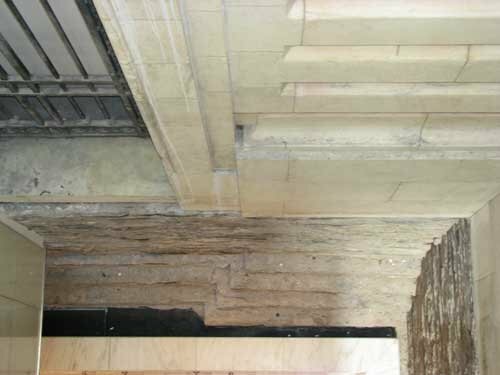 You can still see a chunk of the old reservoir if you know where to look inside the library. Carrere and Hastings delivered a grand design. The grandest structure in the city to this day, I think, with its sweeps of stone, its vaulted arches, its treasure trove of seven floors of books. Still, it’s no Crystal Palace. Imagine the wonders you would have seen strolling through those light-flooded rooms? Here in Portland, Oregon, we don’t have anything near as grand as that that is man-made. None of our buildings are taller than the surrounding hills, but that suits us, just fine. No, what we have are volcanoes. You can stand on one hilltop I know of and see five of them arranged around you. We have huge rivers, towering waterfalls, and Sasquatch. Okay, maybe we don’t have Sasquatch, but still, we have our own charm. More and more, as I read your blog, Jean, I have the urge to go see these things you speak of. I still love your works, and I share them whenever I get the chance! I wonder how that compares to the original cost relatively speaking. Also what kind of exhibits they’ll have? 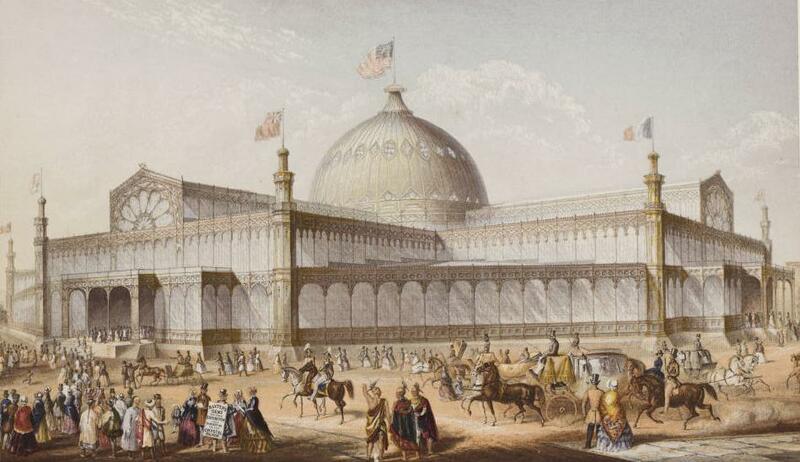 The Crystal Palace in London is going to be rebuilt, by a Chinese company, for the sum of 500 million pounds!